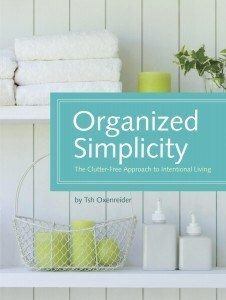 Organized Simplicity: The Clutter-Free Approach to Intentional Living by Tsh Oxenreider is a ten day plan that details step by step how to organize every room in your house and de-clutter too. Don’t worry…..it may sound like a lot of work but the author presents it in a simple and easy to follow manner that is not as overwhelming as it may seem at first to accomplish. Organized Simplicity tackles areas in your life including “The Why” which is about “Living Simply in the Real World” and addresses time, money, home management etc. The second part of the book “Ten Days to a Simpler, More Organized Home” walks you through every imaginable area of your home and by the end of the 10th day your home will be more organized and clutter free than ever (at least mine was). The author even includes helpful templates to make it even easier to follow the guide. Clutter……I admit that five people and one dog living in a 1300 square foot home can lead to a lot of clutter if I am not careful. No one ever warned me that toys could accumulate so quickly and stuffed animals could begin to take over the house outnumbering live people by 3 to 1. There was a lot of useful information to help me organize their play room and home school room (I am not even going to tell you how much educational curriculum that we have accumulated) in just one Chapter devoted to Kid’s Rooms in Organized Simplicity. One of my most frustrating and challenging areas is my linen closet. It is (was) a disaster. I decided to tackle it after reading Organized Simplicity and I am proud to announce that it is looking so much better. I was going to take a “before and after” photo but honestly it was so hideous that I was embarrassed to show the before and was afraid the contents would fall on my head before I snapped the photo. My favorite one piece of information gleamed from Organized Simplicity? FINALLY being able to fold a fitted sheet perfectly….it only took 37 years to do it the right way for the very first time! The organizing tips included in this book are very realistic in my opinion and even more important it is affordable too. I don’t have a lot of extra money to purchase really expensive organizing gizmos and gadgets and that is just not required from Organized Simplicity. The author gives lots of tips and information about how to purchase what you need cheaply or use what you already have. I absolutely loved the section that includes lots of recipes to make your own cleaning supplies using essential oils, white vinegar, baking soda etc. I have been looking for over a year for a natural mold remover recipe and “voila” a recipe appeared in this book. It really worked too so I was very pleased and will be trying more recipes! I really enjoyed this book and appreciate the hints that are helping me get my home more organized. The author hit her goal of making my life “simpler” because less truly is more and I have found that it has also led to less heated discussions with my husband now that we have less clutter lurking around our home. To learn more about the book, the author or to purchase Organized Simplicity you are invited to visit the website.